Fast foodies, rejoice; it’s National Hot Dog Day! Here in Chicago – where it’s probably hot enough to grill up a sausage on the sidewalk right now – there’s something you gotta know: we take hot dogs very seriously. Seriously. Chicagoans stand by a strict “no-ketchup, not ever” rule for our hot dogs; we’d sooner be caught sneaking a paper-thin slice of New-York-style ‘za than dare ask for a classic Chicago dog with ketchup on it – especially on the ever-sacred Hot Dog Day. 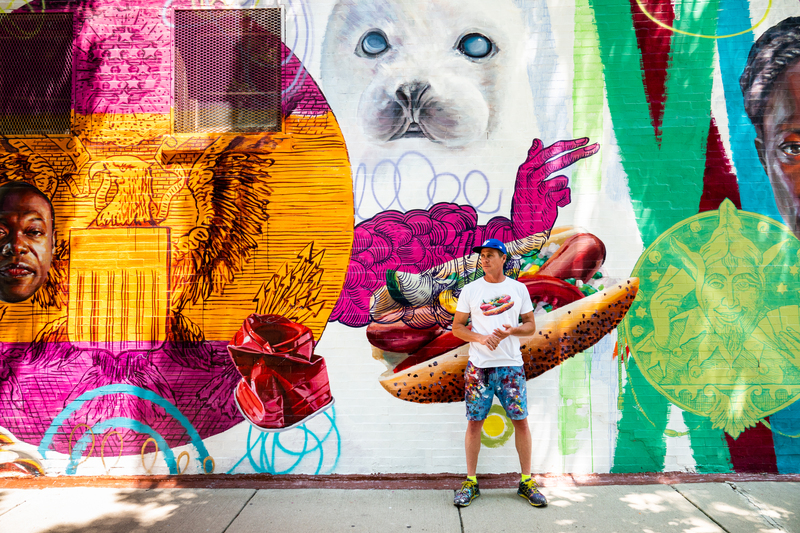 And local muralist Jeff Zimmermann has made an art of paying homage to our city’s weird & fierce appreciation of ketchup-less dogs through a medium Chicago has grown to love: street art. 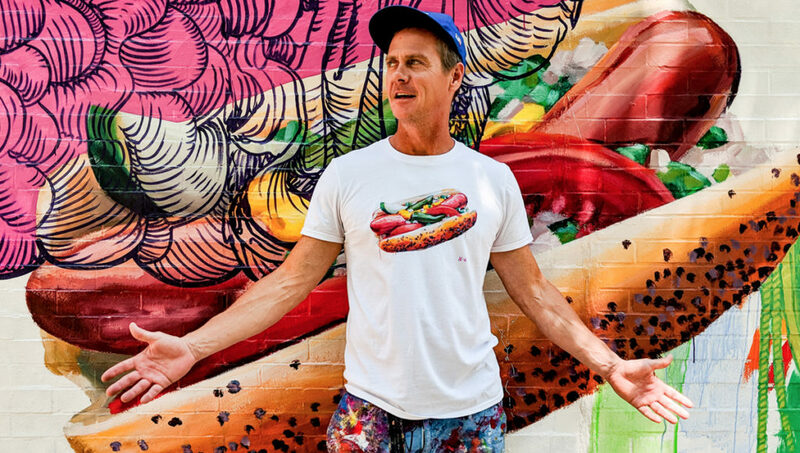 He’s not only filling our city with massive, building-sized murals – he’s also made Chicago’s hot dog staple a staple of his own art style, leaving Chicago dogs on walls for all to see. 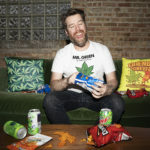 To celebrate National Hot Dog Day and the (hot)dog days of summer, we talked to Jeff all about how he plans his massive murals, street art in Chicago, and of course, about whether he sticks to our city’s no-ketchup rule. Visit his studio below! 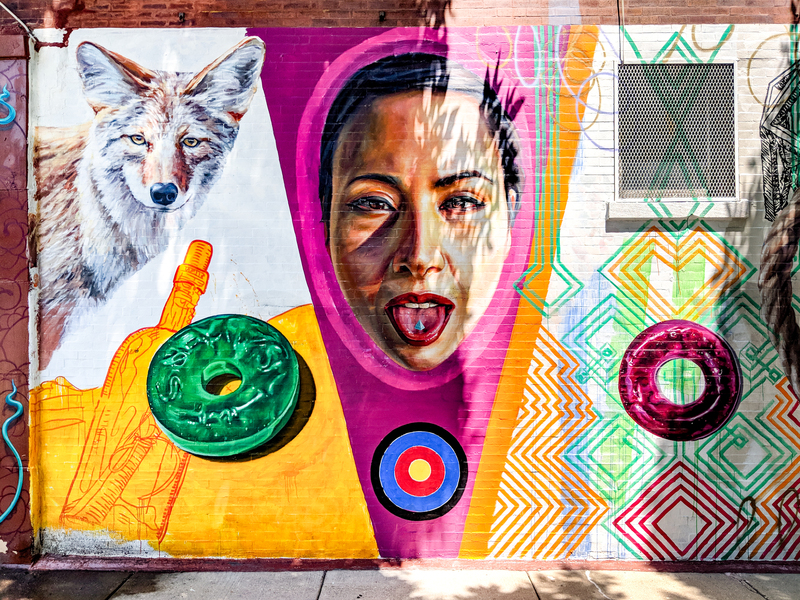 Chicago deemed 2017 “The Year of Public Art”: as a Chicago native, how has the street art scene in Chicago (and the public’s view towards it) evolved? The year of public art was a validation of what we public artists do. The fact that the city is so behind public art (which includes a lot of non-traditional street art) has been a long time coming. The scene has changed 180 degrees since I first started throwing up my murals back in 1997. It wasn’t considered Street Art (capital S, capital A) back then; it was some sort of vandalism. We had to find out-of-the-way, almost abandoned locations to create our work because no one wanted that kind of thing “ruining the neighborhood”. These days, developers are actively seeking out street art and including street art locations in their plans. Hotdogception! Jeff standing rocking his “Chi-Style!” shirt in front of a Chicago dog he painted. How did you first get started creating murals? What’s the largest mural you’ve ever created? Someone saw that I was volunteering teaching art to kids. Googly eyes and popsicle stick type stuff. They asked if I could create a five-story mural. I thought “how hard could it be”? That was the beginning. The tallest mural I’ve created is 16 stories high. A look into Jeff’s studio. 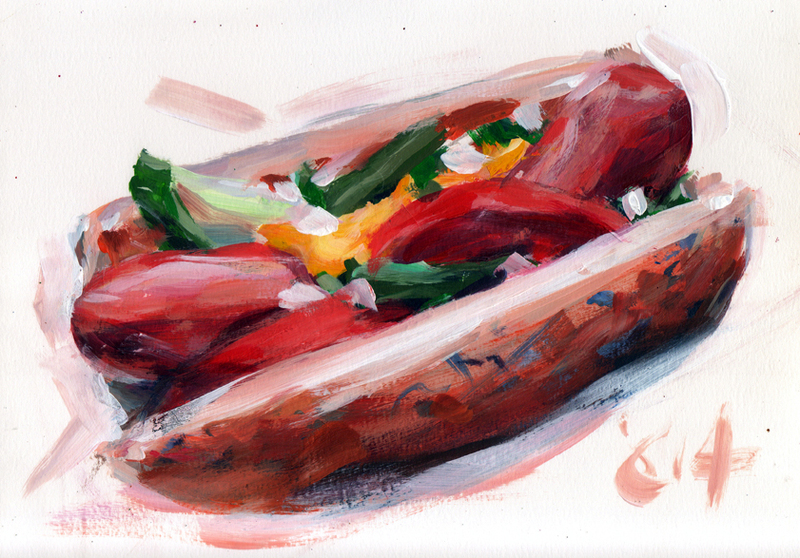 Tell us a little bit about your Chicago dog art and the designs in your Artist Shop! I’ve been painting hot dogs in my murals for years. Everyone knows our city is associated with this street food. I like to include it for a few reasons. First, the foodies get real defensive. “This ain’t no hot dog town anymore! People fly here from Asia for dinner”! True. This town ain’t so provincial anymore. Good for us. The hot dog is funny but – more importantly – cheap street food. We need this food just like we need the working class that supposedly consumes it. When it and they are gone, we’ve lost a full economy. We’ll end up like any other post-industrial city on the Great Lakes. Second is “The Summer of Likes”. I was watching a docu about Bobby Kennedy; 1968 was a crazy time, and the public was active. The public was out in the streets. The public was showing up at rallies getting behind the cause that they believed in. There were clashes between the public and the cops. (“They got the guns but we got the numbers…” – Jim Morrison). Those were some hands-on times! The year before was called the “Summer of Love”. Here we are 50 years later. 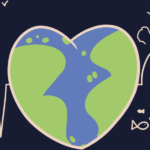 Political and social involvement is as easy as giving a post a like. Give it a like, and go back to your Netflix. There’s some real rancor out there. Our country is in a precarious situation. 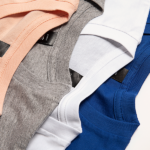 We got the numbers…wait, look out the window. Where is everyone? 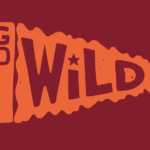 The designs and a few products from Jeff’s Artist Shop! Get yourself a slice of Chicago here. If you’re older than 10, it’s sacrilege to use ketchup on a hot dog. Should start a fist fight. One of Jeff’s murals. 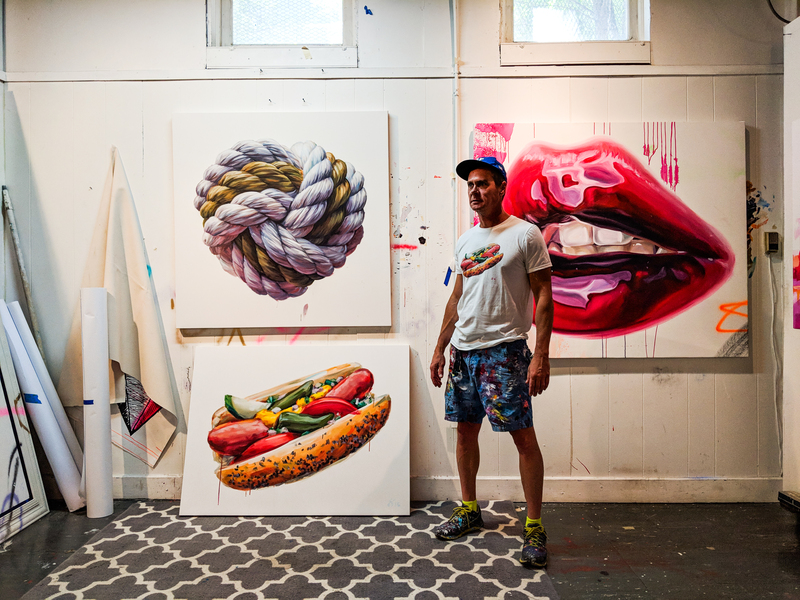 Many of his pieces feature a mixture of pop culture imagery, bright colors, hyper-realistic faces, and more. How do you go from planning murals out from a small scale idea on paper to a large-scale work? Everything begins on a napkin and the size of the design grows from there all the way up to finished artwork. Through experience, you can see what will work and what won’t when it goes from small paper to actual size. A WIP version of “Chi-Style!“. 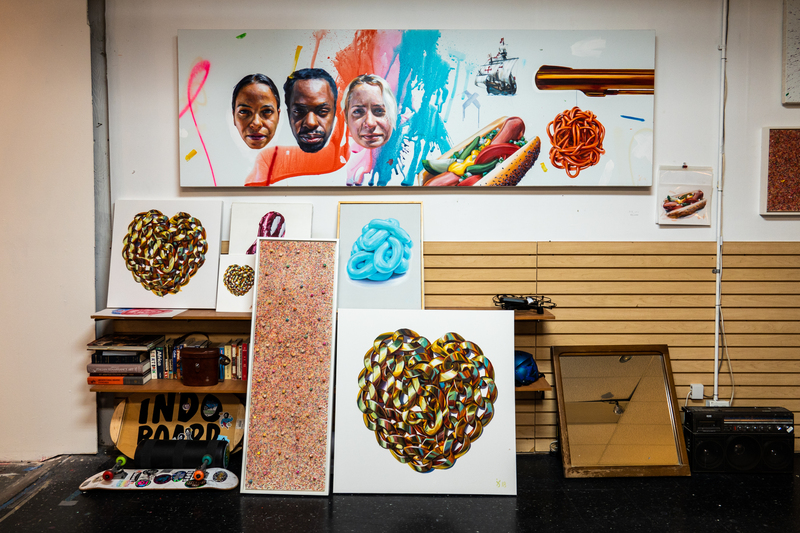 In an interview with the Chicago Reader, you said that you try not to do propaganda/political art but you’d like to be a political artist – how do you find this balance? I put political ideas out there. I do not represent my idea of what the solutions are. If I can make different people confront the issue itself, political dialogue will ensue. Working in Chicago on a mural in the west loop and Evanston through the summer. One quick Love Knot in Nashville. The same in Istanbul in the fall and a solo show/retrospective in October at the Zhou B Art Center. 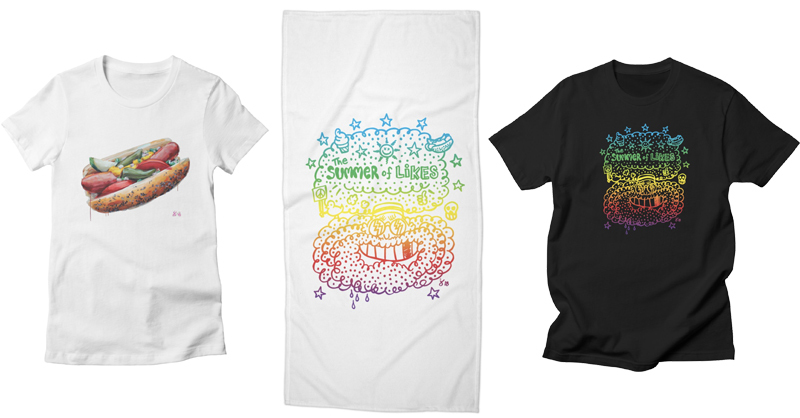 Discover more hot dog designs! Photos courtesy of Craig Shimala. 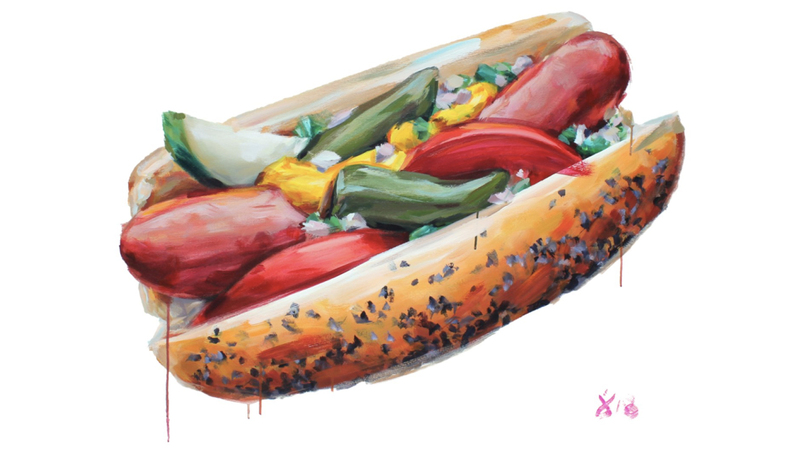 Posted in Blog, Spotlights and tagged chi-style, Chicago style hot dog, hot dogs, Jeff Zimmermann, murals, National hot dog day, street art. Bookmark the permalink.